It’s kind of a dumb show, but have you watched Eureka? (Don’t run out and watch it if you missed it, this isn’t a show I’d recommend to normal people.) We watched a couple seasons of it, but probably only one episode sticks in my mind. The one where the whole town loses its sky high IQ because they’re eating cloned chicken breast. Anyhoodles, with my freezer full of home grown chickens, boneless skinless chicken breasts are not on the docket. It’s made me realize how ubiquitous the boneless skinless chicken breast has become. Whole chickens have a huge advantage; they taste better. Their only drawback is that they can be a little more trouble. They take a little planning, and very few modern recipes start out with the whole bird. This is my go to “recipe” it tastes delicious and it doesn’t take long to get started. It is a great company dish or a great weekend soup, I’ll make it Friday or Saturday and we’ll eat it all weekend, it tastes better the second day. This is a super forgiving dish, so start out here and see where it takes you. I don’t think I make it exactly the same way twice, but I paid attention and made notes just for this occasion. Saute onions and garlic in oil, add chili powder and oregano. Place in an eight quart crock pot.Add all tomatoes, salsa, and beans, and give it a stir. Add the chicken with breast side down and add enough water to fill pot and cover chicken. Cook on low 6 hours. Pull the chicken out of the pot carefully, it will probably come out in pieces. Allow chicken to cool enough to handle comfortably. Pick the meat of the bones, shred and salt the meat and return in to pot. Taste for seasonings. You can add heated chicken broth to the pot if you prefer a thinner soup. Serve with garnishes on the side with warmed tortillas and chips. Notes: Watch the heat, heat gets stronger in the crock pot, medium salsa works well and if I’m throwing in a stray jalapeno it needs to go in toward the end. 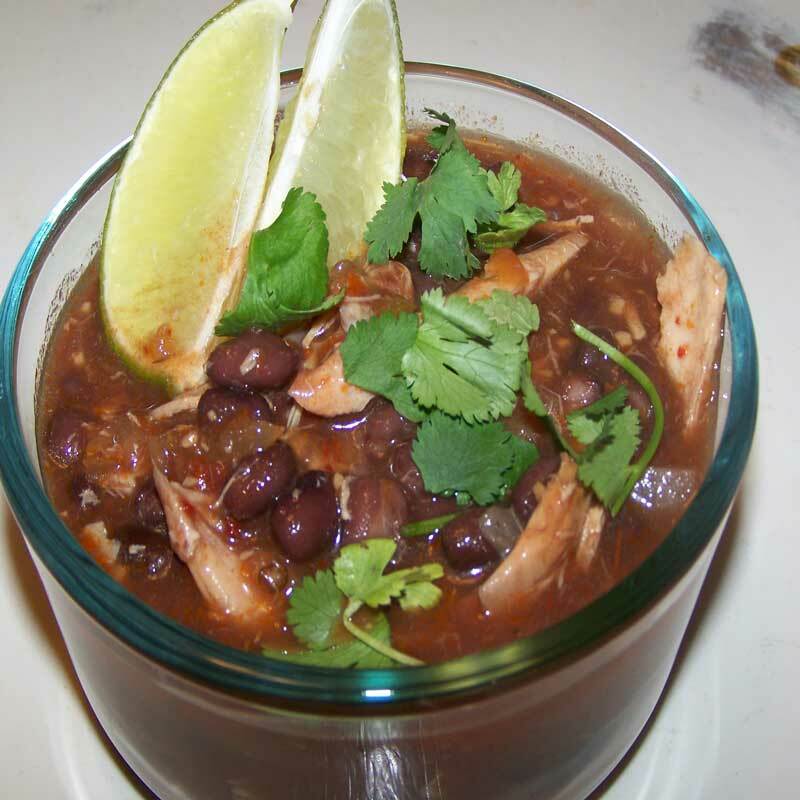 I often use a cup of soaked dried black beans instead of canned beans, but they do add cooking time to the soup.